Fun, Fun, fun....I was going through some old photos that my mom had given to me and found some old Christmas ones. I just had to scan them and share them with you, and not just because I was such a little cutie either ;) But because looking at these old photos made me remember some really great holiday memories that I thought I would share along with the pictures. I don't really remember much about this one, it looks like I was about 2 years old here. I can tell you that I still LOVE the taste of peppermint and candy canes...LOL! And don't you just love those little footie jammies - cute huh? This one had the year 1976 on the back and that would have made me 4 years old at the time. I don't remember much about this year either....I guess my memories don't go that far back. But it's a cute picture, so I had to share it, ha! In this one I'm about 5 years old and that's my Grandma Tressler (my mom's mother). I used to love going to her house every summer. She was a fun grandma and had a huge backyard. She had a rose garden that I loved sitting in the middle of and smell the flowers and play with my Barbies (I guess that's one of the reasons roses are one of my favorite flowers). I loved her house. I loved the laundry shoot, that we would get yelled at for rolling Matchbox cars down. I remember her making homemade ice cream. I remember that my grandpap would slice ice cream from the carton, a trick that I use today with my own kids. I still have the dollhouse furniture that my grandfather hand made for me one year for Christmas (one day I'll have to get it all out and take some pictures to share). I once had a lady offer me over a hundred dollars for that furniture. I turned her down flat...even though it will never be played with again, it is a treasure that I will always keep. 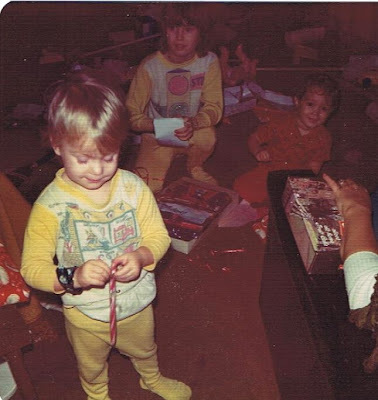 Another fond memory was every Christmas our entire family would get together at their house. We would eat dinner and exchange gifts. Everyone picked a name for the secret santa and we would go around the room, oldest to youngest and pick names out of a hat and buy that one person a gift. It's a memory that has stuck with me for years. When we would sit down for dinner, the adults would sit in the dining room and the kids in the kitchen. Clearly, you can see how much I treasure those times. 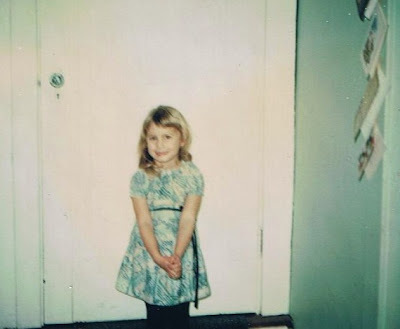 I was 6 years old in this picture. 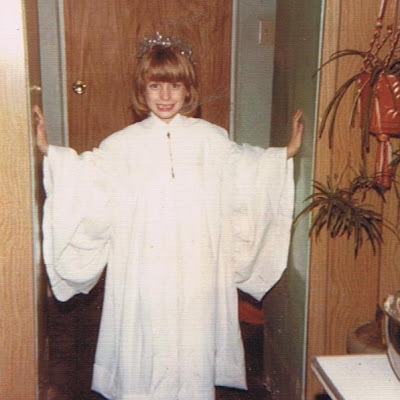 See, I can be an angel - when the need arises. The date on this one says 1979 - making me 7 years old. Not sure if you can see it in the picture, but my mother used to have this plastic fruit/lifesaver like garland that she put on the tree every year. For some reason, every time I see a multi pack of lifesavers I think of this garland. Another year after my younger brother had just learned all the states and capitals, my mother took a USA puzzle and made ornaments out of all the states. I also remember my mom would complain every year about the tree not fitting back in the box. I remember we had black electric tape wrapped around the box trying to keep the tree in the cardboard box until the next year. Now every year, when I dig out our own tree, I flashback to that black taped up box hahaha - ah, the stupid stuff that floods our memories. This one is dated 1980 (I was 8, for those keeping track). For some reason it's the last one I found. 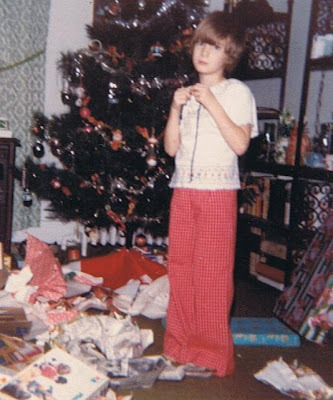 By the look on my face, I think it's pretty clear that this was the last year that I believed in Santa. That's my twin on the right. 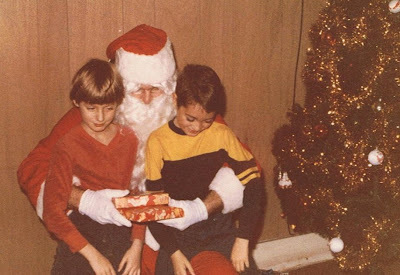 My mother belonged to a "Twin Club" and every year they would have a big Christmas party, where the parents would bring presents and Santa would pass them out like he brought them. Funny how many memories one little photograph can bring back, eh? I hope you have some wonderful memories from when you were growing up as well. And just to warn you....you have no idea what power the scanner has unleashed - expect more fun memories and old pics to come. 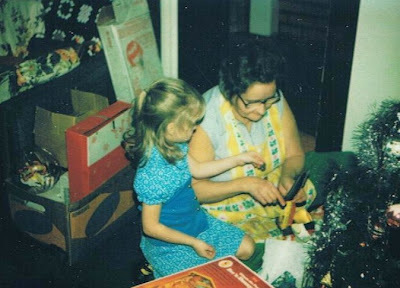 Thanks for letting me share my Christmas memories with you! These bad boys are mine....All Mine. Why do we, as parents go out of our ways to make things nice on holidays for our kids when they are either too young to remember, too ungrateful to care or too unappreciative to even say thank you. Have you ever wondered about that? I know I have. We don't have any family that comes to our house for the holidays. It's just me, Rich and the kids (for the most part) and yet, I find myself baking endless amounts of cookies and goodies, hams and turkeys. I make homemade crafts and ornaments with the kids. I cook food out the wazoo. I clean and clean (and clean some more when the kids trash it). I decorated everything so that it looks nice. And really, I mean seriously who cares about all of that stuff? Am I doing it so that the kids will have great memories of the holidays when they grow up? 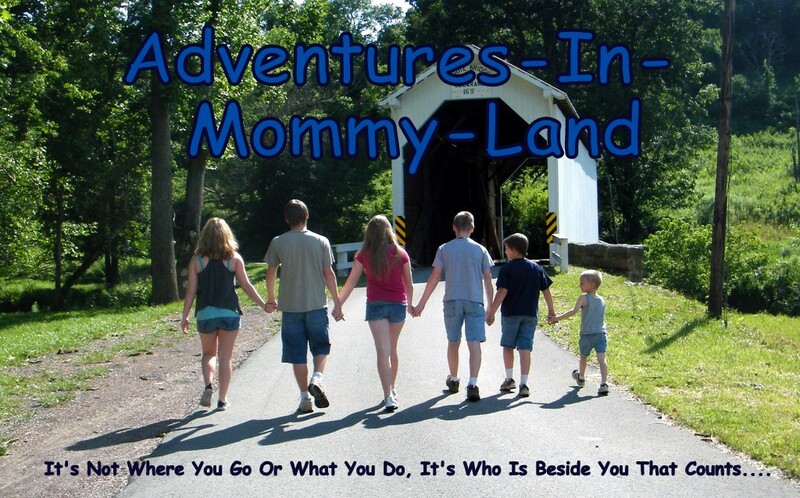 Am I doing it to make myself feel good about being a good mother or wife? Am I doing it just because I've always done it? It's not like I have to prove anything to anybody, especially when there isn't anyone coming over. No one really sees all the stuff that I do. The presents that I took hours to wrap and place bows and ribbons just so on the package, gets ripped off in a matter of seconds. The photos that I took hours to get just the right one (or close enough to the right one), just gets thrown in a box with other photos that no one really looks at again. Same thing with the cards that I painstakingly (and yes, writing out eight people's names on 30 some cards gets pretty painful), either gets thrown out or just tossed in another box. The hours that I spend standing in the stores debating on what game to buy (one that they won't lose the pieces to on the very first day), what books, I think they might like, what clothes I think might look nice on them or that they would like or that will stand up to the many tests of 4 ornery, rambunctious boys or the pickiness of 2 snobby girls. Or the time spent agonizing what to buy for friends, family, the kids' teachers, etc. So why do I do these things? Why does anyone do these things? What's the point in it - Really? I think about these things every year, and I still don't have an answer (and I probably never will). Sarah and I stayed up late a few nights ago and made all these. After being up for so long - well - let's just say, we started to get a little goofy (more than usual). We made a huge mess, but we had fun making it (and isn't that what life's all about). After taking time to bake Christmas goodies and cookies (chocolate covered pretzels, cake balls, sugar cookies, peppermint cookies, snickerdoodles, etc.) I went to work. When I got home I noticed somebody helped themselves to the pretzels and cake balls. I was upset, but figured that goes with the territory of having kids. Went to work again tonight and came home to find out that the kids ate the rest of the pretzels and cake balls - Of which I had NONE. Didn't even take a sample of these when I made them. I was so mad that I had to leave the house. In the past I just let things like this go. It was one of those things where I just didn't feel it was worth the battle. But now that they have done it and gotten away with for so long, they just do it and think they can, because there aren't any consequences. And I realized that I was creating a bunch of little monsters. So when I got back from the store, I sat them all down and explained that it wasn't so much that I spent alot of money buying the things to make all that stuff, and I spent alot of time doing it and that it wasn't even the fact that I didn't get any. It was the fact that after they were busted on it, they didn't even apologize. And I told them that it was my fault because I let them get away with it for so long, but now they had to pay the piper. I told them the thing that upset me the most was they didn't even realize that other people had feelings and they didn't respect mine at all. I also told them, that I spend alot of time running them back and forth to their activities and I do it because I want to be nice. I want them to do fun things. I don't ask for much and I do those things because I want to. But it really hurt my feelings that they cared so little about me that they didn't even save one stinkin' pretzel. Then, I made them clean up the mess they made while I was at work and told them all to go to bed. I just found this note a few minutes ago.......It's nice to know that at least one of them listened. I'm sorry for eating the pretzels. I just took 2, and I made sure there was at least 3 left, but I guess someone ate the rest of it. I would like to say thanks for buying and wrapping the gifts for the class and my teacher. I also want to thank you for taking me to and from basketball and other activities. I know you told me that I should apologize and say thank you, so this probably means nothing, but I still want to say sorry and thanks. I left her a note in her backpack. Thank you for the note Sarah. It was very thoughtful. Enjoy your apple. Love, Mom (I left an apple in her bag too, because I'm nice like that). It's so hard getting kids to look at the camera, smile and look half decent. You can imagine how much harder it is with six children. Someone is always looking in the wrong direction. Someone's shirt is half tucked in/half untucked. Someone always has to try to give bunny ears. Someone always has to stick their tongue out or make a funny face. Someone always runs off before you are done taking the pic. You realize after you print out the pic that someone's shirt is dirty. Eventually you just give up and think if you want a pic of my kids, come and take one yourself! Nicholas asked to sign up for wrestling this year. I couldn't refuse, I also thought it would be the perfect outlet for him. Name an 8 year old, with three other brothers, who wouldn't love wrestling. He went to his first match Friday night. He was super excited. He sat there with his teammates and watched the other kids do their matches. And finally it was his turn. He looked a little nervous, but also very happy and excited. I'm not sure what he expected it to be (like at practice, maybe?). He faced off his opponent with a HUGE smile on his face. The other boy must have been wrestling longer than Nick, because he had his game face on. Nicholas looked a little startled at first, when the boy took him down, but that didn't last long. The smile stayed on his face the whole time. The match didn't last long and he lost, but he had a really great time....and who could ask for more. God, I LOVE my boy!! You'll get 'em next time Buddy!